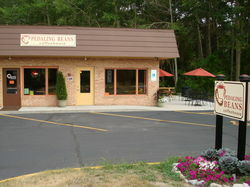 Enjoy Leelanau County, and...... coffee, lattes and more at Pedaling Beans Coffeehouse. For information about wine tasting at Leelanau counties 14+ wineries, great Golf Courses, Fishing Charters, Sleeping Bear National Lakeshore Dunes, Kayak and Canoe Rentals, Seasonal events, and Lodging and Rentals and more contact the Leelanau Peninsula Chamber of Commerce at www.leelanauchamber.com. For road and mountain bike events and for mountain bike trails and great road routes check out the Cherry Capital Cycling Club at www.cherrycapitalcyclingclub.org. 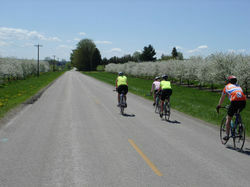 May bicycling among the Cherry Orchards! Come find us on M-204 just east of the Lake Leelanau Narrows. We found Pedaling Beans!! !and we're glad we did!! !